IT architects are responsible for working with lines of business staff and capturing business needs. This person must translate those requirements into an IT solution that satisfies the current business goals and exhibits several characteristics. To improve this process, the IT architect needs to identify and leverage existing assets. 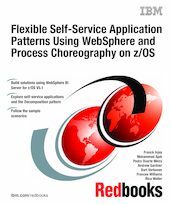 In this IBM Redbooks publication, you learn how to leverage a key set of assets, the IBM Patterns for e-business. You learn how to use these patterns with key architectural elements to deliver on demand and autonomic architectures for the best qualities of service. This book is designed as a resource for IT architects who specialize in enterprise or mainframe systems. It presents business scenarios that you might come across and best practice design guidelines to help you implement solutions. Part 1 provides an overview of the IBM Patterns for e-business, with a focus on Self-Service business patterns. Part 2 explains concepts, design considerations, technologies, and architectural elements that are key when designing an architecture based on the IBM Eserver zSeries platform. In Part 3 we explain how to prepare and set up the WebSphere Business Integration Server Foundation (WBISF) run-time environment on z/OS in order to deploy and test the sample business process application scenarios. Part 4 describes the implementation of these Self-Service business pattern sample scenarios on the zSeries platform.